The 4396A provides excellent RF vector network, spectrum, and optional impedance measurements for lab and production applications. Gain, phase, group delay, distortion, spurious, CN, and noise measurements often required for evaluating componenets and circuits can be measured using one instrument. When combined with a test set, the 4396A provides reflection measurements, such as return loss, and SWR, and S parameters. 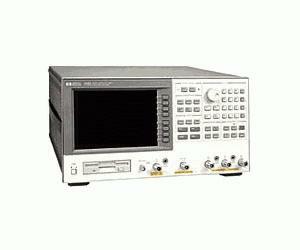 As a vector network analyzer, the 4396A operates from 100 kHz to 1.8 GHz with 1 mHz resolution and its intergrated synthesized source provides -60 to +20 dBm of output power with 0.1 dB resolution. The dynamic magnitude and phase accuracy are +-0.05 dB and +-0.3 deg so that it can accurately measure gain and group delay flatness, which are becoming more important in modern electronic systems.